The biggest fight of Claressa Shields’ career drew slightly lower viewership than her previous appearance on Showtime. Nielsen Media Research viewership figures released Tuesday revealed that the Shields-Christina Hammer fight drew a peak audience of 369,000 viewers Saturday night. Average viewership for their 10-round middleweight title unification fight was 339,000. 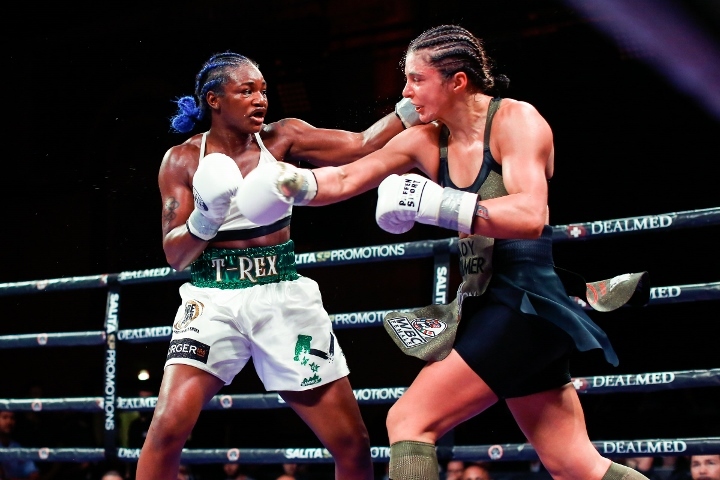 While her victory over Hammer on Saturday night didn’t draw more viewers than Shields’ prior performance on Showtime, the viewership was higher than Showtime’s first four “ShoBox” telecasts of 2019. Each of those four shows aired on Friday nights. Saturday’s viewership also was the second-highest for a “ShoBox” broadcast in the past two years, behind only Shields’ defeat of Hanna Gabriels last year. Her win over Hammer was about as thorough as her victory against Gabriels last June 22. Shields settled into a comfort zone following the first few rounds and completely out-boxed the previously unbeaten Hammer in the main event of a “ShoBox: The New Generation” tripleheader from Atlantic City, New Jersey. The two-time Olympic gold medalist won eight rounds on all three scorecards. Two judges scored the completely one-sided eighth round 10-8 for Shields, who won 98-91, 98-91 and 98-92. Her convincing victory supported Shields’ stake to her proclaimed position as the best women’s boxer, pound-for-pound, in the sport. The viewership figures weren’t quite as persuasive as the judges’ scores. The 24-year-old Shields’ 10-round, unanimous-decision defeat of Gabriels was viewed by a peak audience of 410,000 and an average audience of 376,000 last June 22, a Friday night. Shields survived a first-round knockdown against Gabriels to win 98-91, 97-92 and 97-92 nearly 10 months ago at Masonic Temple in Detroit. The Shields-Gabriels fight represented an encouraging sign for women’s boxing because it drew higher ratings on Showtime than the network’s live offering of the Anthony Joshua-Joseph Parker heavyweight title unification fight just 2½ months earlier. The live telecast of Joshua-Parker, which aired late in the afternoon on the East Coast of the United States in March 2018 from Cardiff, Wales, peaked at 379,000 viewers and averaged 346,000. Showtime’s replay of Joshua-Parker, which aired later that night, attracted higher ratings than the live broadcast (peak: 483,000; average: 430,000). The bout between Shields (9-0, 2 KOs), of Flint, Michigan, and Hammer (24-1, 11 KOs, 1 NC), of Dortmund, Germany, was promoted as the biggest fight in women’s boxing history because it featured undefeated middleweight champions. Her victory made Shields women’s boxing’s undisputed middleweight champ. She also joined IBF/IBO/WBA/WBC/WBO welterweight champ Cecilia Braekhus as only one of two women to own at least four recognized world championships in a weight class. This promotion also was considered an advancement for women’s boxing because it was the first title unification fight broadcast by a premium cable network in prime time on a Saturday night in the history of women’s boxing. Shields-Hammer faced competition Saturday night from one boxing broadcast (FS1) and one boxing stream (DAZN). Only one of those main events, DAZN’s stream of the Jaime Munguia-Dennis Hogan 154-pound title bout, was offered at least partially at the same time as the Shields-Hammer match. The FS1 main event, an ill-fated super middleweight match between Peter Quillin and Caleb Truax, began after Shields-Hammer ended. Uzcategui’s Agent Warns Caleb Plant: This Isn’t Porky Medina!